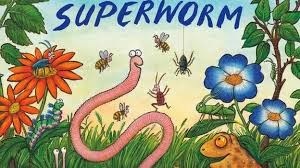 Books for Children with Autism: Superworm! There was a toad on the road. Superworm became a lasso to pull the toad. Superworm then became a skipping rope for animals to play on. An animal was going to sink into the well. Superworm became a fishing line to rescue her. A crow put Superworm in his beak. Superworm’s friends tried to rescue him. When Superworm came back, he became a swing! Then a slide! Superworm even became a belt! And a hat! And an ac-ro-bat!